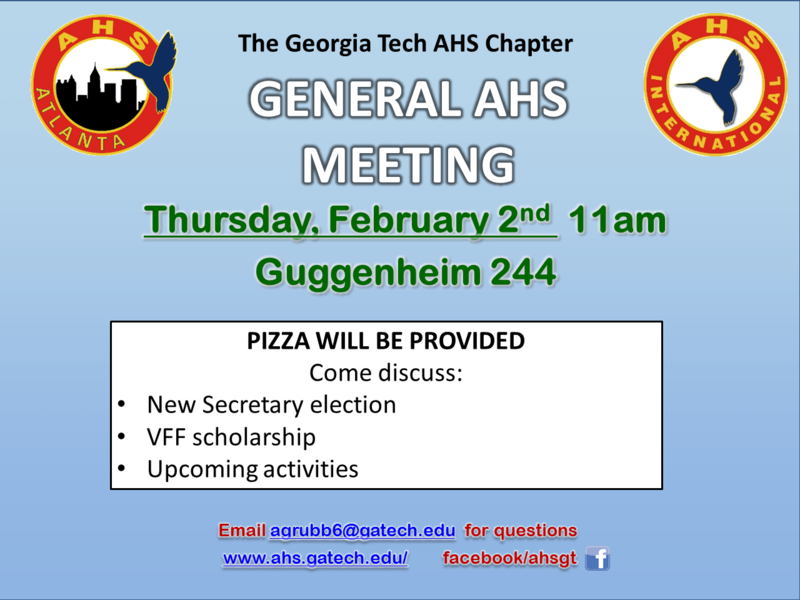 Join us Next Thursday February 2nd, for GT-AHS general meeting. Welcome back to a new semester. We are excited to get things up and running again! Please join us on Thursday, February 2nd at 11:00 am in Guggenheim 244 for our first meeting of the semester. We will be discussing some upcoming events as well as hosting a workshop that will help you complete your Vertical Flight Foundation Scholarship application packets! Pizza will be provided. So, What is the Vertical Flight Foundation Scholarship? Applications are due to Dr. Marilyn Smith no later than noon on Monday 02/06, however she would prefer to receive them by 02/03. Georgia Tech has had many previous VFF winners, and some of our past winners are still current students. Some of these past winners will be at our meeting on Thursday, February 2nd to review your application packets and provide helpful feedback. If you’d like to participate, please bring your completed resume and narrative to the meeting next week! We are also looking for a new secretary for this semester. If you are interested in the position, please email Amanda Grubb (agrubb6@gatech.edu) by Wedensday 02/01. We will vote on this at the meeting on 02/02.